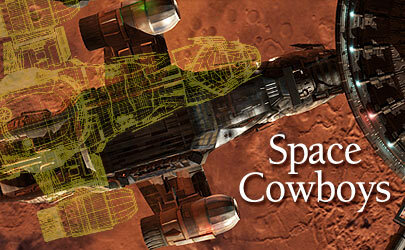 Director of photography David Boyd brings an Old West aesthetic to Firefly, a Fox sci-fi series set in deep space. Photos courtesy of 20th Century Fox Television. Like the Westerns of John Ford, Howard Hawks, Sam Peckinpah and Anthony Mann, the Fox series Firefly centers on people who are trying to find a place for themselves in a harsh frontier environment. But while the television show maintains the feeling and some of the dress and weaponry of the Old West, its setting is outer space. "I love spaceships and I always wanted to make a show set on one," says Joss Whedon, the show's creator and executive producer. "To me, the future is going to be like the past: a life thats difficult and full of people scraping to get by and trying to find meaning." In the series, an interplanetary civil war has ended in victory for the Alliance, an organization that sought to unify the planets. Those who fought against the Alliance are now scattered across the galaxy, trying to survive as best they can. One of these ex-soldiers, Malcolm "Mal" Reynolds, is the captain of the Serenity, a ragtag cargo ship with assorted crew who do whatever they must to get by. Like the ship and its crew, the series has a raw aesthetic. "Weve taken as many rules as possible and thrown them out the window," says cinematographer David Boyd. "Weve crafted a documentary feel, with all the imperfections that entails; we love imperfect focus, non-intentional composition and lens flares. Everything we do photographically is intended to reflect life in this small, enclosed space called a spaceship." Many of the shows key crewmembers are veterans of another Whedon series, Buffy the Vampire Slayer, but Boyd and Whedon had never met before the Firefly pilot. Boyd was brought to Whedons attention by a Fox executive who was impressed by Boyds work on a pilot called Cold Shoulder, which he filmed on 16mm reversal stock. Whedon told Boyd that rather than making the world of Firefly a stereotypical science-fiction environment, which he sees as "purple and stately," he preferred tones that were warm and lived-in. The pair subsequently discussed Westerns such as Heavens Gate, The Searchers and McCabe & Mrs. Miller. "I wanted to get away from science fiction that would distance itself from you," says Whedon. "I wanted you to feel as though youre there." Firefly is shot primarily on three soundstages at 20th Century Fox in Los Angeles. One is used for sets built for individual episodes, while the other two contain the sets for the Serenity. The upper level of the ship is on one stage, the lower level on the other; on both stages, the sets are contiguous so the action can run continuously from one part of the ship to another. To take advantage of the sets layouts, the show is covered largely in long blocking patterns. The camera follows the action from room to room, as if its a person observing the scene and moving in closer to look at anything that seems interesting. There are rarely wide, long-running master shots. "If we do something that you might call a master, part of it usually travels close into some salient aspect of the story," says Boyd. "We try to block so that a big chunk of the shot is fairly intimate, even as it moves from one space in the set to another." Rather than going into longer focal lengths for coverage, the camera crew generally moves in on the same wide lens. "Our operators are free to resize and react to action as it unfolds," says the cinematographer. "I try to create an atmosphere in which everyone can freely participate." The entire show is shot handheld to maximize camera movement and flexibility. "Weve learned that this is an approach we can sustain," says Boyd. "Our A-camera operator Allen Easton is a rare mix of consummate craftsman and athlete. And its a marathon, not a sprint." Camera assistant Jonas Steadman says that the crew tried using a Steadicam on the pilot, but the camera movement was too smooth to suit the show. Now, even when the crew uses a dolly or a crane, the operator sits on it, handholding the camera. "We never use a head unless its a lock-off for effects," Steadman reveals. Working handheld is especially difficult because the cameras are Panaflex Gold IIs, not a lightweight camera system. Steadman explains that smaller cameras have less soundproofing, and because the crew tends to push in close to the action the sound departments microphone is often right over the matte box. "When new directors come in, they have to rethink their coverage," Steadman says. "Traditional coverage would kill us because of the camera's weight." Boyd likes to keep the camerawork fluid, almost weightless. "Compositionally, we find things rather than frame things. We allow ourselves to operate behind the action rather than to anticipate it." Lens flares further convey this approach. Boyd began shooting the series with Primos, but he soon exchanged them for lightweight zooms and Super Speed MKIIs to increase the likelihood of flaring. "The Primo Macro Zoom 14-50mm is a beautiful lens, but I couldnt get that thing to flare no matter what I tried," he says. The show is filmed primarily with a lightweight 17.5-34mm T2.8 zoom, and Boyd also often uses a lightweight 27-68mm T2.8 zoom. The primes the production carries are a 14mm, along with 50mm, 75mm, 100mm and 150mm Mark II Super Speeds. Boyd films most of Firefly on Kodak EXR 500T 5298, sometimes switching to EXR 200T 5293 for effects shots that need a finer grain. "I like the old stocks a lot for this show," he submits. "We also shot most of an episode with cross-processed Fuji 50D; it was wildly appropriate for scenes in flashback. He rarely uses filtration, but he has shot through varying colors of plastic wrap and even an LTM single scrim on occasion.